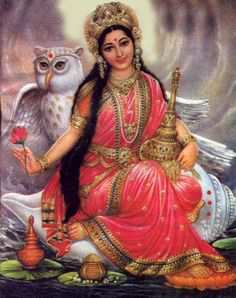 In the Hindu pantheon, Bhumi Devi (or Bhu Devi or Bhuma Devi) is worshipped as the divine Mother Earth. She is the Goddess of Earth or the Goddess who is the Earth. Bhumi Devi is believed to be the consort of Varaha, the third avatar of Lord Vishnu. In Hindu mythology, the analogy between Bhumi Devi and reverence for the earth is unmistakable. We are indebted to the Mother Earth as She is not only a life-giver but also nourishes and sustains us. It is one of the reasons for which various aspects of Bhumi Devi have been extolled by scriptures and hence figures in mythology in different capacities. Bhumi Devi's incarnations have been found recorded in the Varaha Puranam. She is the daughter of Kashyap Prajapati. According to Srimad Bhagavatam, Bhumi Devi is the mother of demon Narakasura or Naraka. Bhumi Devi has also been depicted as one of the two forms of Lakshmi, the other form of the Goddess being Sridevi. Bhudevi is also seen as the fertility form of Goddess Lakshmi. According to some beliefs, Bumi Devi is also Satyabhama, wife of Lord Krishna in Dwapara Yuga when Lord Vishnu assumed His incarnation. She has also been solemnized as Andal, a famous poet- saint of Tamil Nadu as an incarnation of Bhumi Devi who as a young girl was wholeheartedly dedicated to Lord Vishnu and wished to marry Him against all odds. Andal was the daughter of a priest who offered garlands to the Lord. So strong was Andal's desire to marry Lord Vishnu that she did not observe religious decrees that prevented her from secretly wearing the garlands before offering them to God. When she was finally caught and rebuked by her father, the Lord appeared in his dream and told him not to object her to wear garlands before offering to Him. He also wished His desire to marry her. Thus, began worship of Andal, originally Bhumi Devi that continues to date in all Srivaishnava temples. According to the Uttara kanda, the final episode of Ramayana, Bhumi Devi is the mother of Goddess Sita. After Agni Pareeksha when Sita leaves her husband Lord Rama, the earth opens up and enfolds Sita in her lap. It is her mother, Bhumi Devi embracing her daughter who returns to Her. Bhumi Devi is illustrated in a variety of ways. She is sometimes portrayed in votive statuary wherein She is shown seated on a square platform supported by the back of four elephants. The elephants represent the four directions of the world. When Bhumi Devi is represented with four arms, She is shown holding a pomegranate in one hand, a water vessel in another, one with a bowl of healing herbs vegetables in the fourth. She is depicted with two arms one holding a blue lotus in the right hand with the left hand in the Abhaya Mudra indicating fearlessness. "Let us respectfully contemplate upon Bhumi Devi as She is the Supreme provider and brings us abundance"
18 Mukhi Rudraksha beads invoke Bhumi Devi. 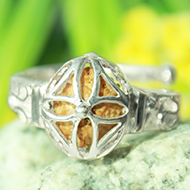 It can be worn with positive thoughts to invite her love, warmth and blessings.